Everyday extra thin and soft Merino Wool socks. Ideal for leisure or business. You will be surprised. 80% Merino Wool without elastic band. These socks prevent sweaty feet, blisters and frictions. Because you can’t be comfortable without your own Wundersocks. The materials that give our socks comfort and durability are found in the mountains, both in natural products and those derived from them. Wundersocks are made from a custom blend of Merino wool, nylon and elastane. This is the strength that holds the Merino wool together. The soft fabric is known for its durability and breathability, and is widely used in athletic wear. Merino wool is the softest and warmest wool there is, and that’s why we use only the finest strands in our socks. Your socks need to stay up. This exceptional elastic fiber makes sure they do. Wundersocks are designed and made in Italy by Sport Mayrl, a family-owned business in the South Tyrol region of the Italian Alps. We have spent 30 years perfecting our socks with the help of locals and outdoor experts. Based on our experiences, research, and exhaustive tests and trials, we developed our merino wool socks right here in the heart of the Alps, and they truly live up to their name – "Wundersocks". Studies show that only 25% of European citizens are aware that the 112 emergency number can be dialed throughout the EU. 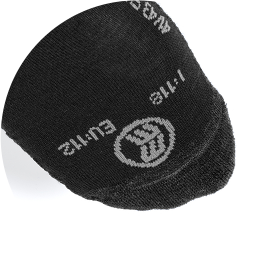 All the more reason why we added the European emergency number, in clear, high-contrast stitching on both toes.